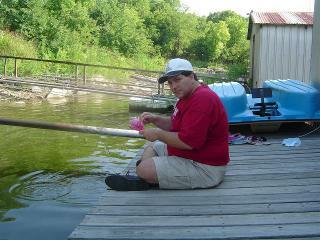 Here I am with my daughter's "Barbie" fishing pole, trying to catch anything. If you look closely, you can see my other daughter pulling in a fish. This was taken at my parents' house down on Ft. Gibson Lake. I think Audrey pulled in 5 perch; I only got 4. At least I smelled like fish at the end of the day!